Medium: original etching. A charming pastoral composition by Barbizon artist Charles Emile Jacque, printed in Paris and published by Gazette des Beaux Arts ca. 1880. Plate size: 3 3/4 x 5 1/4 inches (100 x 135 mm). Not signed. Condition: a few spots of foxing to the margins, but the image is clean. Charles Emile Jacque original etching "Paysage, Soir"
Medium: original etching. This impression on Arches laid paper printed in 1880 for Philip Gilbert Hamerton's very scarce "Etching and Etchers", issued in an edition of 1000. Plate size: 4 3/4 x 7 7/8 inches (120 x 198mm) with good margins. Signed in the plate by Barbizon artist Charles Jacque (not by hand). Medium: original etching. This impression on Arches laid paper printed in 1880 for Philip Gilbert Hamerton's very scarce "Etching and Etchers", issued in an edition of 1000. Plate size: 7 1/4 x 5 1/2 inches (185 x 140mm) with good margins. Signed in the plate by Barbizon artist Charles Jacque (not by hand). 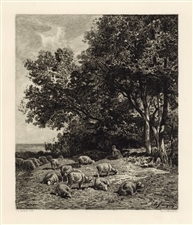 Charles Emile Jacque | James Smillie etching "Landscape with Sheep"
Medium: etching. Etched by James D. Smillie after this charming pastoral composition by Barbizon artist Charles Emile Jacque. This rich, dark impression on heavy cream wove paper is from the Sylvester R. Koehler portfolio of etchings, published in 1885 by Cassell & Company. Image size: 7 3/4 x 6 3/8 inches. Signed in the plate, not by hand. Condition: there is minor foxing in the margin, not affecting the etched image.